Tiger Chef's professional-weight baking sheet pan features folded corners and is heavier in gauge than that of standard home bake ware. Traditionally these wide shallow pans are used for baking anything from sponge cakes and cookies to bars and rolls. 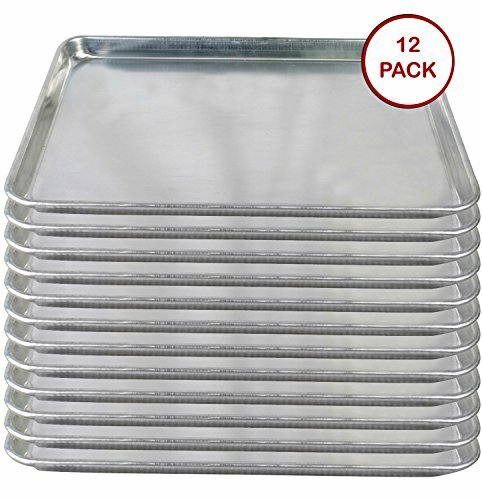 These sheet pans are durable, feature excellent heat conduction, are stackable, and have countless baking uses- a perfect addition to your home or commercial kitchen. - THE ONLY SHEET PAN WITH 100% SATISFACTION GUARANTEE: Buy with confidence because we offer a Money Back Guarantee if you do not love this product.